Extremists shut down the screening of a movie about the life of Jesus when they tried to attack the missionaries showing the movie. A Gospel for Asia-supported film team that had been warmly received by villagers was run off by anti-Christian militants recently while showing a movie about the life of Christ. When the trouble began, about 150 people—children as well as adults—were watching the film, which was being projected on a large outdoor screen (a sheet hung between two poles!). Film team leader Sarwar Howlader was working with a local pastor, Gayak Samaga, who is a GFA-supported national missionary. The film team was invited to the village by a local businessman, Lakshan Jatan, who watched the movie when the team showed it in another city. After about 45 minutes of music and singing, everyone was excited when the show about Jesus began. Then, after the crowd watched intently for more than an hour, a group of six anti-Christian radicals approached the film team, threatening them and warning them to stop the showing. 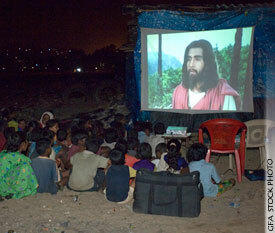 Declaring that they had permission from the village leaders to show the film, Sarwar insisted that it continue. And as the film team began to worry that the militants were about to physically attack them, the crowd began to shout down the radicals. As it was clear that the villagers wanted to see more of the Jesus movie, the militants became more enraged, cursing the team and telling them to show “worldly” films instead. Finally, the invaders tried to incite the crowd against the GFA-supported missionaries by saying that they were trying to force the people to become Christians. Frustrated and angry, the six militants finally surged forward with the intentions of physically attacking Sarwar and the rest of the film team. The missionaries, not wanting to create problems for the local church by being involved in a fight, retreated and left the village, much to the dismay of the people. Read how a women’s film team also faced opposition—from both humans and demons. Watch this PhotoShow to see how GFA film teams are showing the people of Asia the way to Jesus.